Harris Tweed is widely regarded as the world’s most luxurious wool fabric, used in clothing, footwear, accessories and of course, homeware. There is an incredible range of colours and patterns available, with approximately 4,000 styles on record. The Tweed Workshop at Mansefield Studios has nowhere near that number, but we do have a gorgeous capsule collection of cushions, lampshades and accessories designed and commissioned right here in the gallery. From gorse yellow and misty blue to blossom pink and forest green, our range has something to catch everyone’s eye. Established in 1993, The Harris Tweed Authority is the guardian of Harris Tweed and the iconic Orb Trade Mark. By law, Harris Tweed is defined as “…a tweed which has been hand woven by the islanders at their homes in the Outer Hebrides, finished in the islands of Harris, Lewis, North Uist, Benbecula, South Uist and Barra and their several purtenances (The Outer Hebrides) and made from pure virgin wool dyed and spun in the Outer Hebrides”. 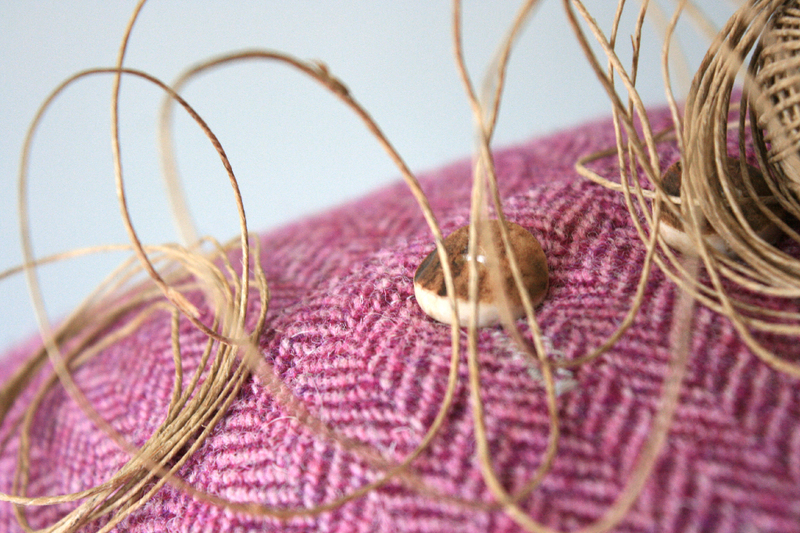 All of our Harris Tweed products carry the Orb label, certifying their aunthenticity. In the same way that Champagne can only come from the region of France that gives it its name, Scotland has Harris Tweed. Harris Tweed – we love it! Harris Tweed is stunning. Harris Tweed is special. Not all tweeds are HARRIS TWEED! 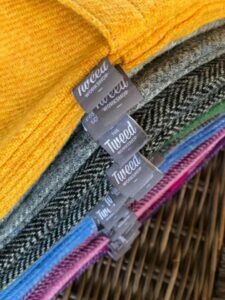 To meet the legally-prescribed definition of Harris Tweed, tweed has to adhere to a strict specification: a tweed must have been hand-woven by the islanders at their home in the Outer Hebrides and made from pure virgin wool dyed and spun in the Outer Hebrides. Tweed that does not comply with these conditions is not Harris Tweed and cannot be marketed as such. Originally this handmade fabric was woven by crofters for personal use, ideal for protection against the cold climate of the North of Scotland. Surplus cloth was often traded or used as barter, eventually becoming a form of currency amongst the islanders: it wasn’t unusual for rents to be paid in blankets or lengths of cloth. By the end of the 18th Century, the spinning of wool yarn from local raw materials was a staple industry for crofters. Finished handmade cloth was exported to the Scottish mainland. 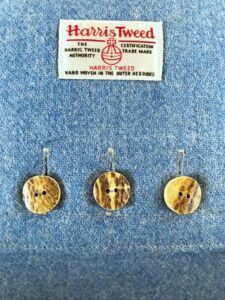 The Harris Tweed Authority is the legally appointed governing body responsible for upholding the integrity of Harris Tweed in accordance with the Harris Tweed Act of 1993. Today, every 50 metres of Harris Tweed are checked by an inspector from the Harris Tweed Authority before being stamped, by hand, with the Orb Mark. The Orb Mark trademark certifies its hand crafted origins. The stunning colours in the yarn are derived from the colours of the hills and land of the Outer Hebrides. A well-balanced mixture of exquisite colours in the yarn, together with the luxurious texture of the cloth, ensures that everything made from it becomes an instant classic. See? 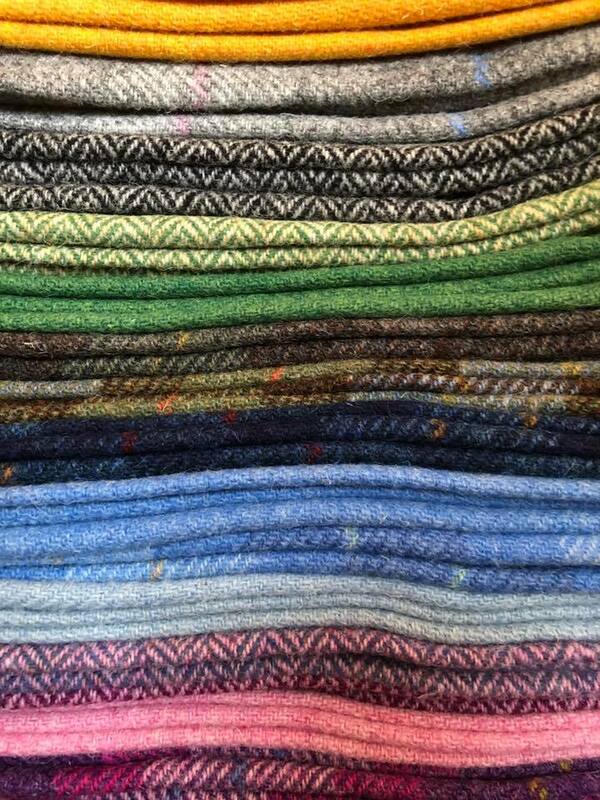 We love Harris Tweed!